Meet my squirrel friend Chiku. 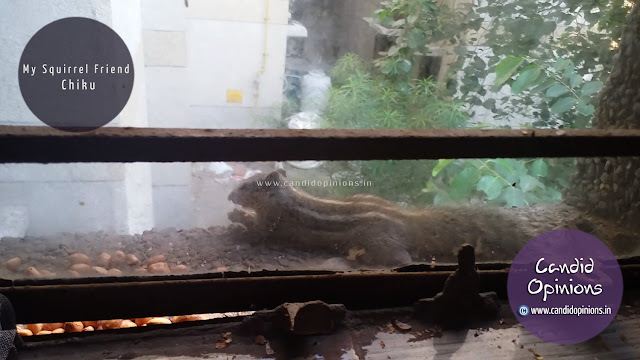 Every day early morning at around 5:10 AM or thereabouts, Chiku used to come and sit on the window sill of my kitchen. I had noticed this while washing the utensils. He would come and lay there, half asleep, probably enjoying the morning breeze. Since last few weeks, I started placing peanuts (moongfalli or "china badam") on the window sill for him every day. Now he regularly comes around that time and gleefully eats them. He has started to trust me, doesn't run away even when I go closer to him. He doesn't speak my language nor do I speak his language, but we still communicate with each other. With trust, even silence can be understood. Without trust, every word could be misunderstood. "Chuin", the street pup whom I have been raising, is now 6 months old and is growing up faster. Here he is having his breakfast (milk and biscuit). He knows my timings, he would diligently come everyday and would wait outside my door at around 5 in the morning when I leave for the park in my colony to collect flowers for puja. He follows me like a friend and keeps sitting there while I pluck flowers and sometimes he jumps over the railings to get into the park and plays by himself. Seeing him play so excitedly is a sight to watch for sure. After I am done with collecting flowers, he once again follows me walking beside me to my door until I give him his breakfast. Upon finishing his breakfast, he licks my hand and walks away... probably that's his way of saying goodbye. Nothing compares to the joy, the inner happiness that you feel when you make someone else happy by a simple gift. You can in fact earn yourself a lifelong friendship!